Tis the season to get stressed out, fa-la-la-la-la… la-la-la-la. No, no, no… that’s not how the song goes. But for many, it is the reality of the Holiday Season (HalloThankMasNewY). and we make ourselves crazy, or broke, to do it. Stress is NOT good for you. It actually can make you physically ill, not to mention emotionally unstable. The holidays are social events that are meant to bring people together, not cause anxiety and stress. At this time, Halloween and Thanksgiving are behind. That leaves Christmas and New Year’s Eve still to come. If you have lots of time and plenty of money, go ahead and splurge if it makes you happy. Many people don’t have the time or the money to do so, but they want to. This is where there could be a stress issue. 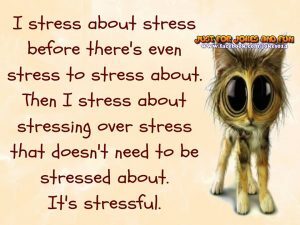 Even more stressful is the situation where someone is giving out of a feeling of requirement, or guilt. Ouch. As for New Year’s Eve parties… Once I got out of the hotel/restaurant business, I have attended only one party. That was in 1999, when we all thought Y2K was going to be the end of the world. We, typically, just sit home and watch the ball drop on TV, kiss each other “Happy New Year” and go to bed. Whoopie, right? I understand some people like to attend parties, or throw a party. The same rule applies, though… stay within your means. You can look fabulous in a Walmart or consignment shop outfit, it doesn’t have to be a top of the line designer thing that you will only wear once. You don’t have to serve the most expensive champagne. Probably the best choice is a middle price option, but if you can only afford a low cost one, then get that. Many time, the stress of the holidays hits AFTER we get the bills. Save yourself from that self-induced stress and do what you can with what you have. Now… Sing we joyous, all together… Fa-la-la, la-la…la-la-la-la.